ROME (CNS) — The head of the Ukrainian Catholic Church said he was consoled by Pope Francis’ words of understanding and tenderness after he expressed the disappointment of Ukrainians with a joint declaration signed by the pope and the Russian Orthodox patriarch. The pope’s remarks were “truly the opening of the doors of mercy,” said Archbishop Sviatoslav Shevchuk of Kiev-Halych, head of the Ukrainian Catholic Church. Pope Francis and Russian Orthodox Patriarch Kirill of Moscow signed a joint declaration in Cuba Feb. 12 and, in an interview the next day, the archbishop said it contains unclear statements on the war in Eastern Ukraine and on the identity of the Ukrainian Catholic Church. He also said his people were deeply disappointed in the declaration’s wording. Responding Feb. 17 to a reporter’s questions about the archbishop’s critique, Pope Francis said everyone has a right to his or her own opinions about the declaration and the archbishop’s criticisms must be read in light of the experience of Ukrainian Catholics. But Pope Francis also spoke about how his friendship with Archbishop Shevchuk began when they were both ministering in Buenos Aires, Argentina, and how the archbishop had given him an icon of Our Lady of Tenderness, which is one of the few things he asked to have brought to the Vatican after his election in 2013. 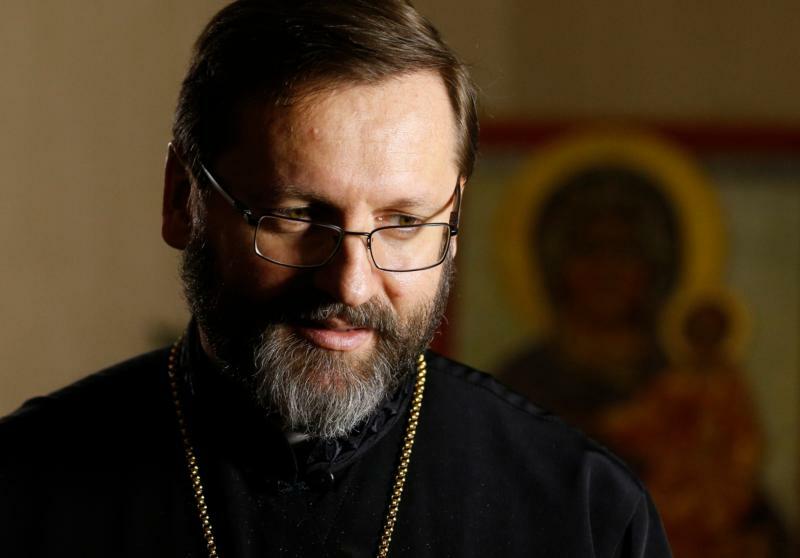 In an interview with Catholic News Service in Rome Feb. 23, Archbishop Shevchuk said he was pleased that even for the pope, the declaration “is not the word of God, it is not a page of the Holy Gospel,” but rather offers indications for discussion. The archbishop said that when the pope-patriarch meeting was first announced, “my spontaneous reaction was, ‘Finally,’ and I was pleased that Pope Francis repeated almost the same when he embraced Patriarch Kirill” in Havana. “I think that the very gesture is sacred — we are supposed to meet, we are supposed to talk, but that meeting is only a tool to start true, sincere dialogue,” the archbishop said. The desire for mutual respect and closer cooperation among Catholics and Orthodox in Ukraine is not in question, he said, but the declaration’s depiction of the situation in Eastern Ukraine and the terminology used to describe the Ukrainian Catholic Church are. In encouraging an end to tensions between Orthodox and Eastern-rite Catholics, the declaration referred to the churches that are in full union with Rome as “ecclesial communities,” a phrase usually used to designate communities the Catholic Church believes are lacking valid sacraments and apostolic succession. Yet, clearly, as part of the Catholic Church that does not apply to Ukrainian Catholics, he said. “The Lord resurrected us to full life 25 years ago after the fall of the Soviet Union,” he added. Under Soviet rule, the Ukrainian Catholic Church was illegal and functioned in the underground; in ecumenical dialogues at the time the Russian Orthodox claimed the church did not exist. Once the Soviet Union dissolved and the Ukrainian Catholic Church began functioning publicly, some Orthodox claimed its very existence was an attempt to encroach on the “canonical territory” of the Orthodox. The other problem with the declaration, the archbishop said, is how it seems to hint that the war in Eastern Ukraine is a civil war and not one involving both Russian troops and Russian support. In announcing the Cuba meeting, Russian Orthodox Metropolitan Hilarion of Volokolamsk, director of foreign relations for the Moscow Patriarchate, said the Russian Orthodox still see the Eastern Catholics as an obstacle to normalized relations. However, he said the need for joint efforts to defend the rights of persecuted Christians in the Middle East was more pressing. In addition to calling for protection and respect for religious minorities, the declaration also urged Catholics and Russian Orthodox to work together to fight secularization, to protect the environment and to defend definitions of marriage and family life. The permanent synod of the Ukrainian Catholic Church was to meet in Rome beginning Feb. 27 and its members hoped to have a meeting with Pope Francis, the archbishop said.